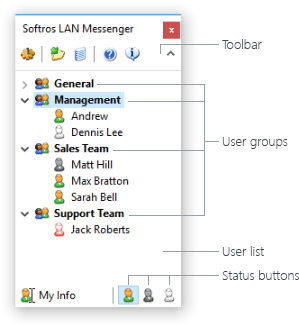 This section details the layout of the main Softros LAN Messenger window. When you start Softros LAN Messenger, the following window shows up on your desktop. Let’s take a look at its elements. This area contains a series of buttons allowing access to some basic features of Softros LAN Messenger. Settings — launches the Settings dialog box. Browse Received Files — opens the folder storing files received from other users. View Message History — loads a special module for browsing through conversation history. Help — launches the help system. About — opens a dialog box with your current licensing and application information. Hide Toolbars — hides the toolbar as well as the My Info and status buttons for a cleaner look of the user list. By default, all users of Softros LAN Messenger, both online and offline, are shown in this area. You can exchange messages and files with other users, view their information plus send broadcast messages to certain or all users in the list. Please note that file transfer functionality is not available for offline users. If you would not like any offline users to show up in the user list, right-click the blank space of the list and then click Hide Offline Users, or check the corresponding check box on the General tab in the Settings dialog box. You can create user groups, move users between them and also manage the groups the way you need. Clicking this button opens the User Information tab in the Settings dialog box where you can change your user name appearing in all users’ lists. If specified in the domain settings, your full name is your default user name. Otherwise, the default user name is your account name in Windows. Clicking one of the following buttons sets your current status in Softros LAN Messenger. Available – you are available to chat with other users. Busy – you are working at the moment but still able to reply to urgent messages and receive files. Away – you are away from your desk. To minimize Softros LAN Messenger to the taskbar notification area, click the Close button found in the top right-hand corner of the main window. You will still be able to receive and respond to messages from other users as well as accept files from them. By default, the Softros LAN Messenger button is located in the taskbar at all times. You can restore the main Softros LAN Messenger window or bring it to the foreground by clicking that button. To restore Softros LAN Messenger from the taskbar notification area, use one of the following methods. Click the Softros LAN Messenger icon found in the taskbar notification area. Right-click the Softros LAN Messenger icon found in the taskbar notification area, and then click Restore. Press the keyboard shortcut preset on the Hot Keys tab in the Settings dialog box. CTRL+SHIFT+S is the default combination.